On Sunday, the world’s largest solar powered footbridge was opened to the public in Brisbane’s Central Business District. About 36,500 people are expected to use the new Kurilpa Bridge each week to walk or bike across the Brisbane River between the CBD and the arts precinct at South Bank. The bridge, which has been described as looking like knitting needles, is not only one of the longest footbridges, but also features a sophisticated LED lighting scheme that is powered by the sun and can produce a number of different lighting effects. The LED lighting system is far more efficient than other lighting systems available and will be used for various festivals and occasions along the river, like the annual Riverfire celebrations on the Brisbane River. The system powering the impressive array of LED lights is made up of 84 solar panels mounted on the bridge, and can generate a daily output of 100KWh and an average yearly output of 38MWh. This is enough energy to power 100% of the energy needs of the bridge and lights in most lighting conditions. When the bridge is fully illuminated, the solar panels can only supply about 75% of the necessary power. Connected to the grid, the bridge can draw power when needed or put excess power back into the grid. 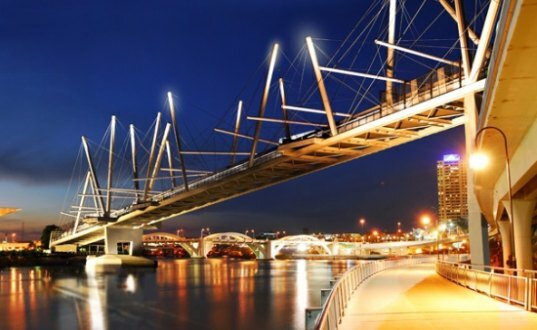 The Kurilpa Bridge cost approximately $63 million and was designed by Australian firm Cox Architects. Claimed to be the longest footbridge of its kind, the bridge spans 470 meters, is 6.5 meters wide and has a deck thickness of 25 cm. The footbridge relies on both tension and compression for support and is constructed from concrete and steel cabling. Named after the Indigenous term for “West End'” the Kurilpa Bridge is expected to save 37.8 tonnes of carbon emissions each year. It`s a very good use of solar energy in a very original work. What a beautiful bridge. I love the idea of integrating solar power lighting into an element like this. On Sunday, the world's largest solar powered footbridge was opened to the public in Brisbane's Central Business District. 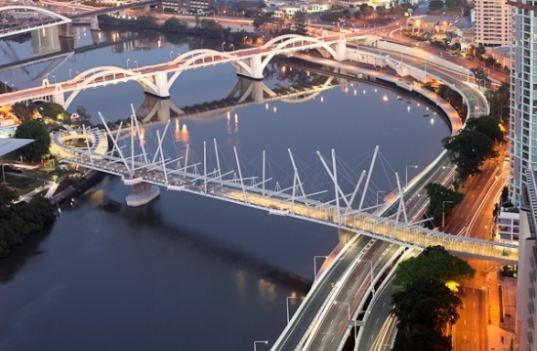 About 36,500 people are expected to use the new Kurilpa Bridge each week to walk or bike across the Brisbane River between the CBD and the arts precinct at South Bank. The bridge, which has been described as looking like knitting needles, is not only one of the longest footbridges, but also features a sophisticated LED lighting scheme that is powered by the sun and can produce a number of different lighting effects.